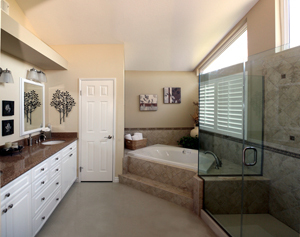 Bathroom design for your home in southern California knows no limits when you work with Reborn Remodeling Solutions. Maybe it’s time to install your own personal spa in your master bath. Or perhaps the kids’ bathroom could use some modifying to keep up with your family’s growth. Whether you’re looking for a personal retreat in your Southern California home or just a fresh, modern bath design, trust Reborn Remodeling Solutions to turn your bathroom into the bathroom of your dreams. Since we first went into business in 1983, we have been family-owned and -operated, and we treat each unique project as if it were for our own home. Throughout the years, we have served thousands and thousands of southern California homeowners, leaving our work on display for all guests to see. We know you pay attention to the little details, which is why we go to all necessary measures to ensure that everything is just as you want it to be. Our ultimate goal is to exceed your expectations and leave you with not only a beautiful new bathroom design, but a lasting smile on your face as well. We take such immense pride in our custom manufacturing and installation services that we back them with a 25-year warranty. For more information about the new bathroom design Reborn Remodeling Solutions can provide for your home in Santa Ana, Orange County, Laguna Niguel, Huntington Beach, Mission Viejo, San Diego, Fountain Valley, Placentia, Yorba Linda, or any other nearby community, send us an e-mail or contact us by phone at 1-877-371-4943. Or, if you’d like, feel free to stop by our 40,000-square-foot manufacturing facility and bathroom design showroom in Anaheim today. We’re open for business seven days a week, and we would love for you to see just how we can give your bathroom the design you’ve always wanted. "David A installed a bathtub, bath surround, shower fixtures and shower door. He was prompt, friendly, professional and neat."